Update: Twitch has confirmed to techradar that these games will be PC-only for the time being. Twitch has always excelled at showing gamers the latest video games, but soon it might just be the best place to play them, too. On the first day of the 2016 Games Developers Conference, Twitch has debuted three new browser-based games that will enable broadcasters and their audiences to play together and against one another inside traditional livestreams. These three new titles are the inaugural "Stream-First Games," a new genre that Twitch hopes will catch on with game developers looking to use the streaming platform as the next big breakthrough platform after traditional consoles and mobile devices. SUPERFIGHT is a game of absurd arguments. Players battle with their wits to determine who would win hypothetical fights between characters with superpowers and super problems. Create ridiculous fighters from the cards you draw, argue with one another over who would win in a fight, then let the audience decide the winner. Wastelanders is a turn-based strategy game built for Twitch, where both broadcasters and viewers play in a live stream. Broadcasters take on the role of a Warlord in a post-apocalyptic wasteland, and lead their viewers in battle against another broadcaster-led team. By watching the stream and chatting, viewers can control warriors on the battlefield, set bounties on opposition Warriors, place land mines, and alter the battle in other fun and surprising ways. 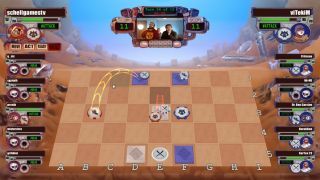 Streamline is a fast-paced, arena-based game that allows a broadcaster to quickly create a party for up to 15 of their viewers and immediately jump into one of several game modes, such as a fast-paced game of cat and mouse, with the broadcaster as a Hunter chasing down the other players as Runners or a stream versus stream team game pitting the broadcasters and their communities against one another. Meanwhile, the other viewers can bet on or sponsor Runners, vote to change the rules of the game, and play mini-games driven by the on-stream action for rewards and recognition using a web browser or a mobile device. The three new mini-games follow in the footsteps of other surprisingly addictive and popular experiments Twitch has conducted over the last year like "Twitch Plays Pokemon," "Twitch Plays Dark Souls" and Rise of the Tomb Raider's Expedition Cards, but instead of coming from the community, are coming from traditional game developers. Twitch hasn't specified if these games will come to all platforms including the consoles when they launch, or if they will be PC-exclusive for the first few months, however the company will have them on display at the GDC 2016 show floor later this week.